Club Penguin Cheats by Mimo777 Club Penguin Cheats by Mimo777: Club Penguin First Memory Reviewed By You! Hey CP i'm so glad you asked that question. The first time I logged into Club Penguin I was very young. I remember standing in the town just wondering where I should waddle off to first. Suddenly a bright blue penguin waddled up to me and said "hey you new here". I shyly said yeah how did you know. She said I looked confused. I asked where you can get the best refreshments. The blue penguin grinned and said "thats easy it's the coffee shop. When I walked into the coffee shop I knew by all the friendly faces and different people that I was perfectly safe on my new favourite site Club Penguin :D.
For next week's Reviewed By You, Club Penguin wants to know if you have someone that has been helpful to you around the island and why you think they should be featured on the blog. Make sure you don't nominate yourself! Who are you going to nominate? What buddy has been the most helpful to you? Hey Mimo that picture looks like the penguins are in the secret hidden lake room. Probably gunna nominate you blokes at CPG. Ahh all my buddies have been awesome to me! I nominate Fredfan4ever and Jewelery22! They are the best friends ever! Slippeestarrs is awesome, too! Today when I went on CP, the site I went to was always on miniclip! This is like really wierd because I dont really go on miniclip! This problem is beond me! 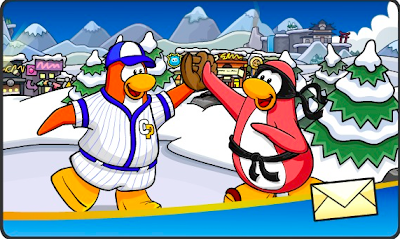 since you have been on CP for longer than me, you should know what the problem is! PLEASE HELP! I CAN'T STAND A SMALL SCREEN! P.S sorry for posting this on a wrong page! My Best moment on CP is when I first loged on and at least 4 tour guides came up to me. They all arguded over who would take me on a tour! *sigh* Oh the good old days of CP! I nominate Mimo777 because if it wasn't for Mimo777, I wouldn't even be playing Club Penguin. I had the same problem last week. But the next day it was back to normal, maybe just another glitch.